Today I’m delighted to welcome Helen MacKinven from Cranachan who is going to tell us a bit about this quite new publishing company. 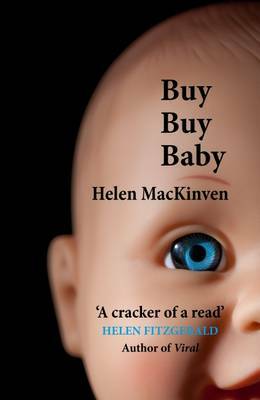 She has also kindly offered a signed copy of her latest book Buy Buy Baby as a giveaway. I read this recently and it’s a fantastic read, very funny but with serious themes too. You can read my review here. Anyway, over the Helen to find out more about Cranachan. Being self-employed means that you miss out on the annual staff Xmas night out (or are perhaps blessed that you don’t have to endure it!). To compensate, my close friend, Anne Glennie, suggested we get together for an Italian meal in Stirling. Over dinner, she served up the idea of us creating a publishing company (after much research) and invited me to be involved both as a writer and publisher. Cranachan wasn’t on the menu that night, but Anne’s proposal most definitely whetted my appetite. We have both followed a career path in education and training, but Anne is no stranger to setting up a business and is a natural entrepreneur. I’m not a born risk taker and I’m more prone to suffering from ‘What if… ?’ scenarios keeping me awake at night. But she convinced me that between us, with our joint skills and knowledge, we could be successful in publishing. By the time the bill arrived, I was licking my lips and raring to go! After Santa’s visit, Cranachan was launched in January 2016 and already (much quicker than we ever anticipated!) we have signed 7 authors, created a strong social media presence (with 1.5k+ Twitter followers, 200+ likes on Facebook, 1.7k+ visitors on the Cranachan website with 6k+ views) and have been inundated with submissions from authors. All of Cranachan’s books are edited, proofed and typeset in-house and, apart from the input of an illustrator or photographer, we do most of the cover design. These designs have been praised by industry professionals and we also support the Cranachan authors by creating promotional materials, such as posters and bookmarks, to market their books. Due to the nature of the submissions that popped into our inbox, with several being high quality children’s historical fiction, we decided to establish an imprint, Pokey Hat, to focus on titles which became the Yesteryear series. Using our expertise and connections in the world of Scottish education, our plan is to create free educational resources for schools to generate interest and enthusiasm for this new series. This is a niche market, but one in which we have researched, and we are confident that there is a demand for high quality novels and related resources within Scottish schools. The Scottish focus and identity is central to our approach and we have developed a brand, Clan Cranachan, which has fostered a sense of community within our group of seven authors and is becoming a recognised hashtag on social media. As we are both writers, we have been through the submission/rejection process (and been badly bruised!) with mainstream publishers and from the outset we vowed not to send vague feedback such as, “you’re not suitable for our list” to anyone who submitted to Cranachan. Instead, although it is time consuming, we offer a personalised critique to every writer. The vast majority of submissions are unsuccessful for a number of reasons but nine times out of ten, the writer responds with grateful thanks to us for taking the time and effort to write a meaningful reply which they can use constructively. Our refreshing attitude (if I do say so myself!) to publishing has generated local and national press coverage with Anne being featured in a two-page centre spread in the Daily Record. It was no surprise to me that Anne’s ‘can do’ attitude provoked media attention as she has demonstrated across every aspect of the publishing process that nothing fazes her. I would like to think that as Anne and I are now in our forties, (haven’t we aged well!) we might be an inspiration to others to show that following your true passions later in life is possible. Our motto is, ‘the proof of the pudding is in the reading’ and we hope you agree! Follow us on social media for news of our forthcoming titles and we promise that the delicious books we’ve chosen to publish will leave readers satisfied and ready to reorder from the Cranachan menu! Thanks Helen. I know that Cranachan have lots of exciting plans and plenty books coming out soon so watch out for those. If you’d like the chance to win Helen’s book, click here to enter the Rafflecopter draw. You can enter up to midnight on Sunday 11th September and the winner will be advised within 24 hours. It’s difficult to choose a favourite dessert when you’ve got a sweet tooth, I like pavlova and meringue always looks difficult to make so I’d opt for pavlova if it was available. Ooh yes, love a raspberry pavlova but dread to think what it would look like if I made one. Probably more like Eton Mess! This weekend we had a Twix cheesecake bought from Iceland and it was the most amazing dessert I’ve had for a long time!! That sounds amazing, never had that before. Oreo cheesecake is pretty good though!